This week's giveaway is from Shelley of Bell Bloom Design. 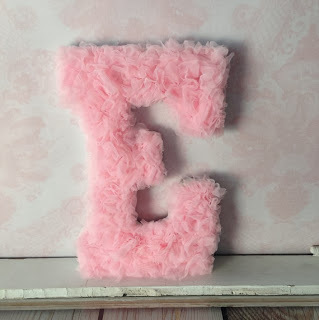 She is giving away this whimsical custom chiffon ruffle letter. The winner will choose the letter and the color - Shelley will do the rest. This fun handmade letter will add some dimension and flair to your child's room or nursery! These ruffled, textured letters letters stand 9 inches tall and can be set on a shelf to lean against a wall or they have nail holes for hanging directly on the wall. Check out the listing for color options. What a unique way to add interest to a room and give life to a child's name. Contest ends Saturday, October 5th, at 12:00 noon Central. One winner will be chosen by Random.org. Please leave each in a separate comment, as each comment is an entry (To qualify for extra entries you must do step one above). And be sure to include your email! 7. Follow Shelley on Pinterest. Comment back here letting us know you are a follower. Contest ends Saturday, October 5th at 12:00 noon Central. One winner will be chosen by Random.org. 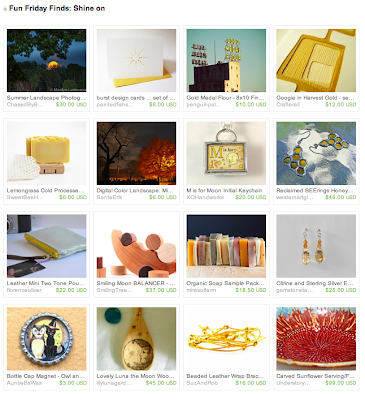 Autumnal Fun Friday Finds—Shine on! This weekend we arrive at that equilibrium of light and dark known as the autumnal equinox. Yes! Fall is upon us. And although we are certainly inclined to see that glorious full moon smiling down on us last night and still tonight as the harvest moon, it is technically not that iconic celestial body just yet, for the harvest moon is defined as the first full moon after the autumnal equinox. But who cares about technicalities? Shine on! 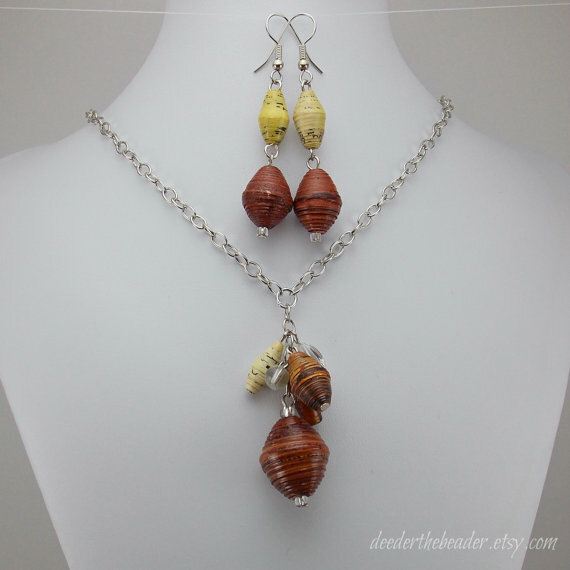 This week's giveaway is from Denise of Deeder the Beader and she is giving away a beautiful and unique Rwandan Paper Bead Necklace and Earring Set. Denise created this necklace and earring set using unique beads that are handmade from paper by women in Rwanda. The women use triangular shaped pieces of paper, roll them tightly, paint and seal them. Each bead is handmade and can have some imperfections but it all adds to the rustic charm of the beads. Denise designed this cluster necklace and earring set using paper and glass beads, accented with nickel tone chain and findings. The paper beads are a combination of brown, rust, off white and light yellow. They are embellished with clear and brown glass beads. The necklace is approximately 22 inches though it can be clasped a couple of inches shorter if desired and it is finished with a nickel tone lobster clasp. Please make sure you include your email address so we have a way to contact the winner! How to Enter: Visit Deeder the Beader, pick your favorite item and leave a comment on this post about it. (Scroll to bottom of post and click on Comments) Please make sure you include your email address so we have a way to contact the winner! Please leave each comment in a separate post, as each comment is an entry (To qualify for extra entries you must do step one above). 4. Follow our blog (you want to do this anyway to learn about upcoming giveaways!). Leave a comment here letting us know you are a follower. If you are already a follower, leave a comment anyway, as each comment is an entry. 7. Become a Facebook Fan of Deeder the Beader. Comment back here with your Facebook name. Existing fans just leave your Facebook name here. 8. Follow Deeder the Beader on twitter. Comment back here with your Twitter link. Existing followers just leave your Twitter link here. 9. Follow Deeder the Beader on Pinterest. Comment back here with your Twitter link. Existing followers just leave your Twitter link here. Contest ends Saturday, September 28th, at 12:00 noon Central. One winner will be chosen by Random.org. 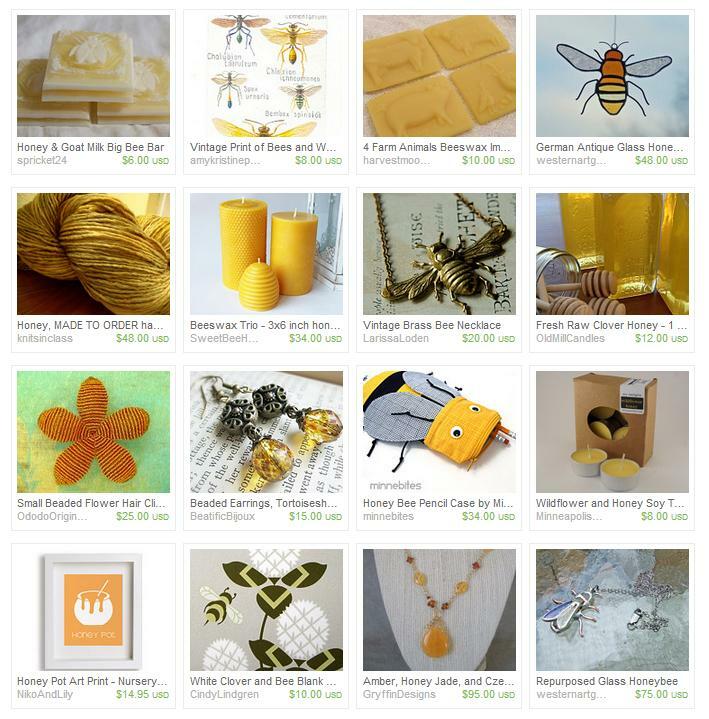 Fun Friday Finds ~ Honey, Honey! I've heard about him before,I wanted to know some more And now I know what they mean, he's a love machine Oh, he makes me dizzy! I fell in love with ABBA's Honey, Honey song when I saw the movie, Mama Mia! It was a "girls night out" and we got silly and had an absolute blast. It was way back in 2008, but it still brings up sweet memories for me. Since September is National Honey Month, it seemed apropos to highlight honey, honey colored crafts and honey bees, created by our local HandmadeMN and Minnesota artists. Please visit their shops to see their amazing items. This week's giveaway is from Margaret of Margaret Mousley Designs and she is giving away a beautiful Basic Black Travel Tee. Margaret loves art and design. She began making dresses for her doll when she was a little girl ended up graduating with a BFA in Fashion Design, She chooses fabrics from the look and feel to give her designs a simple Elegance. This Black Tee Shirt from GO Travelwear is a perfect tee shirt for travel and everywhere you go. The simply elegant classic lines and short sleeves are versatile. This tee shirt can be dressed up or down and paired with many clothes so you can pack light. It can also be worn many places such as shopping, meetings, or meeting for lunch. How to Enter: Visit Margaret Mousley Designs, pick your favorite item and leave a comment on this post about it. (Scroll to bottom of post and click on Comments) Please make sure you include your email address so we have a way to contact the winner! For Bonus Entries: Please leave each comment in a separate post, as each comment is an entry (To qualify for extra entries you must do step one above). 7. Become a Facebook Fan of Margaret Mousley Designs. Comment back here with your Facebook name. Existing fans just leave your Facebook name here. Contest ends Saturday, September 14th, at 12:00 noon Central. One winner will be chosen by Random.org.